Keeping up-to-date with different tax codes, or new laws going into effect in the human resources department takes a lot of time. It's difficult to come across that time for a small business, and can end up costing money, which they can't afford. 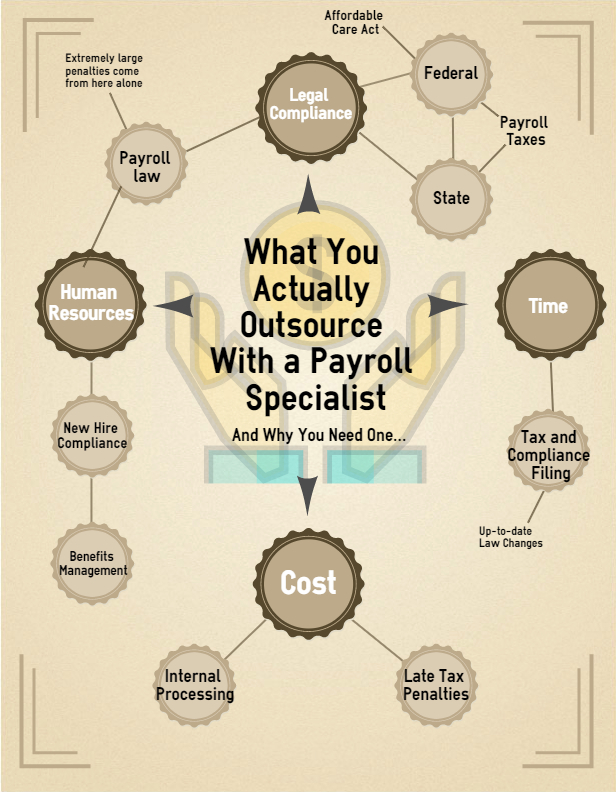 Outsourcing payroll to a professional is the best option. The industry is flooded with competition, and makes for a price that can't be beat. When it comes to shopping for an outsourced payroll provider the #1 concern should be customer support and service, not price. ADP serves over 600,000 companies across the world and has a great reputation for reliability. SurePayroll has an extremely simple way to get a quote and start doing business. Gusto (formerly ZenPayroll) is a great outsourced solution for very small businesses with fairly uncomplicated payroll needs. Keeping in touch with the payroll service provider is important, so it's crucial to sign on with a company that can be communicated with and are sensitive to their customer's needs.